The Martin P4M Mercator was a maritime reconnaissance aircraft built by the Glenn L. Martin Company. The Mercator was an unsuccessful contender for a United States Navy requirement for a long-range maritime patrol bomber, with the Lockheed P2V Neptune chosen instead. It saw a limited life as a long-range electronic reconnaissance aircraft. Its most unusual feature was that it was powered by a combination of piston engines and turbojets, the latter being in the rear of the engine nacelles. Work began on the Model 219 in 1944, as a replacement for the PB4Y Privateer long range patrol bomber, optimised for long range minelaying missions, with the first flight being on 20 October 1946. A large and complicated aircraft, it was powered by two Pratt & Whitney R4360 Wasp Major 28-cylinder radial engines. To give a boost during takeoff and combat, two Allison J33 turbojets were fitted in the rear of the two enlarged engine nacelles, the intakes being beneath and behind the radial engines. The jets, like those on most other piston/jet hybrids, burned gasoline, not jet fuel. A tricycle undercarriage was fitted, with the nosewheel retracting forwards. The single-wheel main legs into coverless fairings in the wings, so that the sides of the wheels could be seen even when retracted. The wings themselves, unusually, had a different airfoil cross-section on the inner wings than the outer. Heavy defensive armament was fitted, with two 20 mm (.79 in) cannons in an Emerson nose turret and a Martin tail turret, and two 0.5 in (12.7 mm) machine guns in a Martin dorsal turret. 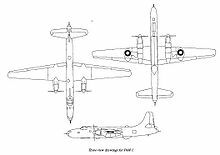 The bomb-bay was, like British practice, long and shallow rather than the short and deep bay popular in American bombers. This gave greater flexibility in payload, including long torpedoes, bombs, mines, depth charges or extended-range fuel tanks. The US Navy chose the smaller, simpler and cheaper P2V Neptune for the maritime patrol requirement, but nineteen aircraft were ordered in 1947 for high-speed minelaying purposes. The P4M entered service with Fleet Reconnaissance Squadron 21 (VP-21) in 1950, the squadron deploying to Port Lyautey (now Kenitra) in French Morocco. It remained in use with VP-21 until February 1953. 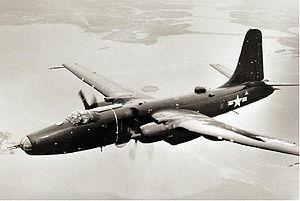 From 1951 P4Ms were modified for the electronic reconnaissance (or SIGINT, for signals intelligence) mission as the P4M-1Q, to replace the PB4Y-2 Privateer. The crew was increased to 14 and later 16 to operate all the surveillance gear, and the aircraft was fitted with a large number of different antennas. Starting in October 1951, electronic surveillance missions were flown from U.S. Naval Station Sangley Point in the Philippines (and, later from Iwakuni in Japan) by a secretive unit that eventually gained the designation Fleet Air Reconnaissance Squadron One (VQ-1). Long missions were flown along the coasts of Vietnam, China, Korea and the eastern Soviet Union, and were of a highly secret nature; the aircraft masqueraded as regular P2V Neptunes in radio communications, and often flew with false serial numbers. One Mercator was shot down near Shanghai by Chinese fighters on August 22, 1956, with its crew of 16 all killed. Another P4M-1Q was attacked by two North Korean MiG 17s on June 16, 1959 with heavy damage and serious injury to the tail gunner. The aircraft were also operated out of Morocco by VQ-2, where one aircraft was intercepted near Ukrainian airspace by Soviet MiG's. It escaped by flying under jet power but ran out of fuel and crashed into Mediterranean Sea with the loss of all crew. The Mercators were replaced by the EA-3 Skywarrior, which being carrier-based had a greater degree of flexibility and the larger Lockheed WV-2Q Warning Star. Final withdrawal from service was in 1960, and all of the remaining P4Ms were scrapped. XP4M-1 Two prototype aircraft with two R-4360-4 engines. P4M-1 Production aircraft with two R-4360-20A engines, 19 built. P4M-1Q P4M-1s redesignated when modified for radar countermeasures. Dorr, Robert F. and Richard R. Burgess. "Ferreting Mercators". Air International, October 1993, Vol.45, No. 4. ISSN 0306-5634. pp. 215-222. Lake, Jon and Robert F. Dorr. "Martin P4M Mercator". Wings of Fame. Volume 19. London:Aerospace Publishing, 2000. ISBN 1 86184 049 7. pp. 138-149. Martin P4M Mercator Pictures and Martin P4M Mercator for Sale.